LINE gives its Philippine-based subscribers up to 30 minutes worth of FREE CALLS to any landline or mobile number in the world. 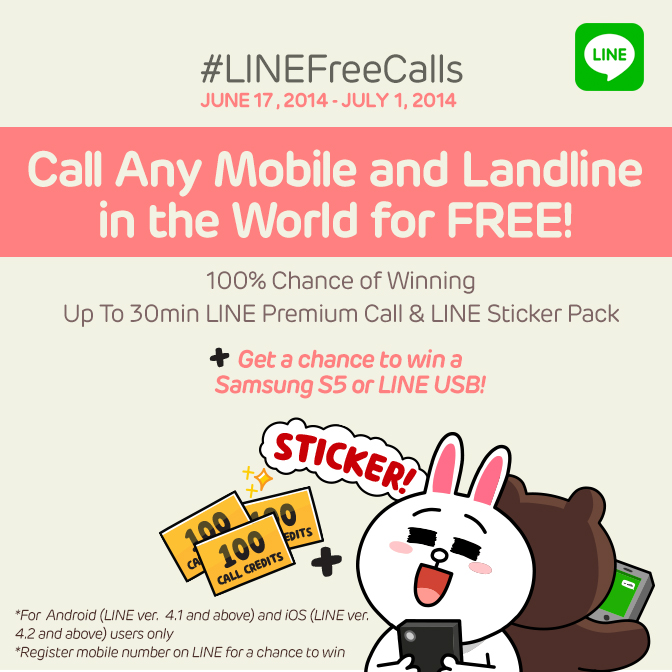 Filipino users will instantly get LINE Premium Call Credits* (up to 300 credits in total), plus an exclusive LINE sticker set, by just sending LINE messages from June 17 until July 1, 2014. Upon sending one message within the promo period, 100 credits will be automatically added to the user’s account balance (for guide info: www.line.me/en/call). This special “LINE Free Calls” promo provides each user with maximum number of 100 FREE call credits per day. Maximum number of FREE call credits a LINE user can receive during the duration of the promo is 300 call credits, equivalent to 30 minutes worth of calls worldwide. Credits will be valid for 30 days. Randomly chosen via electronic raffle, winners will be announced via the LINE Philippines Official Account and the LINE Philippines official Facebook page www.facebook.com/Line.Philippines. Winners will also receive a private message for verification and prize redemption procedures.